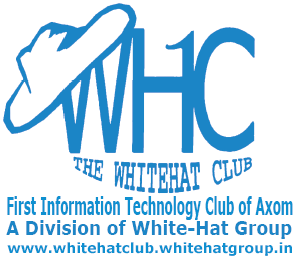 26° 11' 1", 91° 45' 48"
The WHC (White-Hat Club) is the "first of its kind" Information Technology and Electronics Club in the North-East. Here, every club member gets a common platform to learn as well as share their skills on various aspects of Information Technology, Electronics and many other practical, truth-revealing and creative aspects of life with little or no monetary expenditure at all. We are a part of White-Hat Group of Institution which is a “self-sustaining” NGO based out of the North-East which is striving to bridge the digital-divide between the North-Eastern states and the other parts of India by offering free/low-cost IT education to those who want to learn but cannot afford the sky-rocketing price-tag involved with IT Education in this region. We provide the same without any institutionalized mal-practices. Not to mention, we make sure that the same, being offered either for free or for a very low-cost is made highly quality-rich, professional and productivity-centric at the same time. We hack stuff and teach whoever wants to know how to do it... mostly for free or sometimes with a little monetary involvement (to capture costs of organizing the event) Besides that, we have a poll of experts on various fields such as applications programming, software research and development, website designing, Robotics, Electronics, Content Creation, and much more. The term White Hat refers to those IT/Electronics experts who use their technical skills for the betterment of the human race. This page was last modified on 24 June 2013, at 08:27.